Bitcoin advanced on Friday for the first time this week as regulators around the world increased their scrutiny of the largest cryptocurrency, with concerns ranging from investor losses to strains on power systems. The digital asset rose 3.6 percent to $13,941 as of 10:54 a.m. London time, reversing an earlier decline. 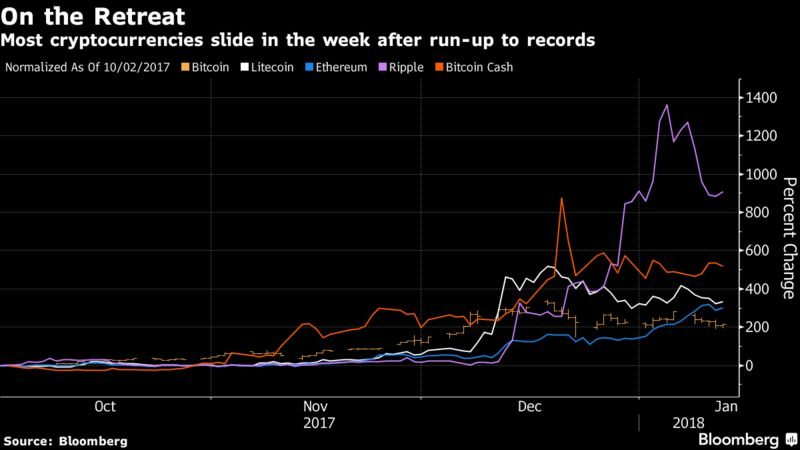 At one point in the week it was down as much as 24 percent, on track for the deepest decrease since January 2015 and falling with many of the largest cryptocurrencies, according to Bloomberg composite pricing. The token peaked in mid-December soon after the introduction of futures trading on regulated exchanges in Chicago. Among the blows to cryptocurrencies this week was the South Korean justice minister’s reiteration of a proposal to ban local cryptocurrency exchanges, though the comments were later downplayed by a spokesman for the president. Meanwhile, bitcoin mining — the process needed to facilitate transactions — is set to become more expensive as China’s government cracks down on the industry, in part out of concerns about power use. In the U.S., scrutiny is set to increase amid concerns about the potential use of cryptocurrencies for fraudulent purposes such as money laundering. Securities and Exchange Commission Chairman Jay Clayton and Commodity Futures Trading Commission Chairman J. Christopher Giancarlo are set to testify to the Senate Banking Committee on risks tied to bitcoin and its counterparts, according to a person with direct knowledge of the matter. The committee intends to hold a hearing in early February, the person said.